Genesys Logic, Inc., a leading IC design company in mixed-signal, high-speed I/O technologies, today announced GL3232, its high-performance USB 3.1 Gen1 memory card reader controller. GL3232 is industry’s first SD memory card reader controller support the 400GB SanDisk Extreme® UHS-I microSDXC™ card and also the world’s fastest UHS-I card reader. GL3232 offer the extra benefits from the existing UHS-I card reader. 1. Base on UHS-I interface, GenesysLogic’s proprietary technology enhance the reading/writing performance significantly. The data rate is twice as SDR104 speed mode of UHS-I. In benchmark test with the 400GB SanDisk Extreme® UHS-I microSDXCTM card, the sequential reading performance is 160 MB/s. 2. The mechanical design of GL3232 reader is compatible with the existing SD 3.0 connectors. The layout rule of signal trace is exactly same as UHS-I and do not need any extra components. Therefore the system designer can easily upgrade the performance of their SD 3.0 card reader product without cost up of RBOM. 3. Thermal effect is another factor to consider in mobile card reader application. To solve this problem, GL3232 integrates 5V-to-1.2V DC-DC regulator to improve the power efficiency. Compared to traditional LDO regulator, the power efficiency of GL3232 is 55% improved and customers can design tiny/compact card readers easily. Compare to the existing UHS-I card reader controllers, GL3232 provide the twice reading performance, the same cost of RBOM and the half of power consumption. GL3232 is the best cost-performance ratio of SD reader controller. GL3232 is available in QFN48 package. 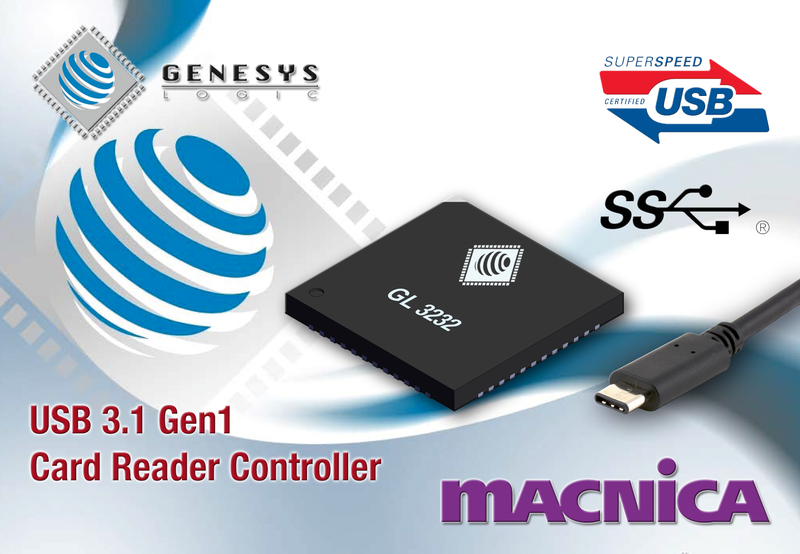 Meanwhile Genesys provide GL3230 in LQFP128 for multi slots card reader controller and GL3231 in QFN64 for dual SD slots card reader controller. Design kit for GL3232 card reader is available now. The kit includes GL3232 controller, firmware, ref. design, evaluation board and immediately technical support. For more information about Pricing and availability info via email: sales.europe@macnica.com. To maintain a competitive advantage in our products and help our customers gain more product advantages, Genesys Logic is continuously introducing more advanced process technology and implementing copper process in our main products www.genesyslogic.com.